The Liverpool City Region is set to be the first place in the North of England to trial hydrogen buses following a successful £6.4million bid to the government’s Office for Low Emission Vehicles. The project may deliver up to 25 buses if the trial is successful. The bid was put forward by a consortium led by industrial gases company BOC, and including the Liverpool City Region Combined Authority and Arcola Energy, working with bus-makers Alexander Dennis, and will be progressed in conjunction with bus operators Arriva and Stagecoach, as members of the city region’s Bus Alliance. The Liverpool City Region Hydrogen Bus Project will see the creation of a new hydrogen refuelling station at the BOC plant in St Helens, which produces hydrogen for industrial customers in the region and further afield. The station will initially deliver 500kg of hydrogen every day. Crucially, the project aims to demonstrate the commercial viability of a model that installs refuellers for high-use fleets to develop a network for future use by passenger cars and other vehicles. 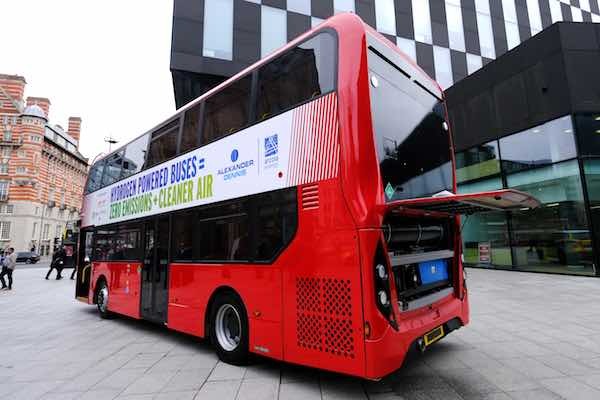 Up to 25 hydrogen–powered buses could service the Liverpool City Region, emitting nothing but water from the exhaust pipe, and will contribute to the city region’s plans both to improve air quality and work towards a zero carbon economy by 2040. The first bus trial is expected to take place in 2020, subject to agreement with the Bus Alliance. As well as providing the fuel cells, Arcola will provide project management for the project. BOC’s hydrogen production by steam methane reforming (SMR) is a core business at three sites in the UK. SMR production of hydrogen is currently the lowest cost production method, essential to enable commercialisation of hydrogen transport and the creation of a UK-wide refuelling network. Liverpool City Region is investing significantly in its strategic priorities, including sustainable transport with funding received as part of its City Deal to support devolution. It has secured £134 million in capital grant from the Transforming Cities Fund for local transport investment over a 4-year period. The aim of the fund is to help transform sustainable transport connectivity in key commuter routes in major city regions. The funding forms part of the wider Strategic Investment Fund. Merseytravel are leading the commissioning process and a significant number of schemes will be developed and delivered from 2018/19 FY onwards. 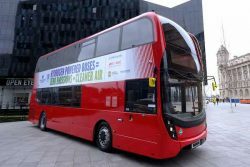 The buses used for the project will be from UK manufacturer Alexander Dennis Limited, with complete hydrogen and fuel cell powertrain supplied and integrated by Arcola Energy. These buses will be the Enviro400 hydrogen double deck bus developed in partnership between Alexander Dennis and Arcola Energy. Alexander Dennis are not a partner in the project, but are fully supportive and will lead the bus production process.